Sponsored by VT Industries Inc. The difference between high-pressure decorative laminate and low-pressure laminate is determined in how they are manufactured. With laminate, time and pressure make all the difference. 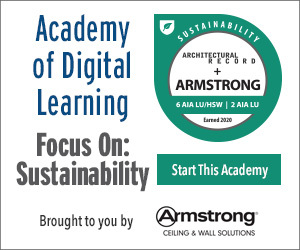 An analogy would be to compare these two types of laminate to carbon. When pressure and time are applied to carbon, either coal or a diamond are produced. So, with coal, less time and less pressure are applied (similar to low-pressure laminate), and diamonds are a result of more time and more pressure (similar to high-pressure decorative laminate). As with coal and diamond, one is harder/more durable than the other. As previously noted, high-pressure decorative laminate is made up of several layers of phenolic resin-saturated kraft paper and a high-grade decorative print paper that is compressed under high pressure and heat for approximately 40 minutes. The bottom layer of kraft paper is sanded to provide proper adhesion between the laminate and a substrate material. 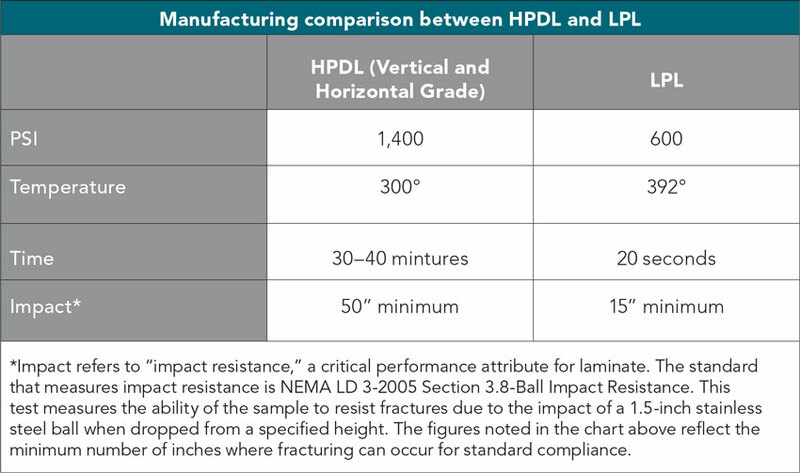 Additionally, as previously noted, the number of kraft/phenolic layers in each sheet of HPDL determines its thickness. Various thicknesses are available that meet National Electrical Manufacturers Association (NEMA) requirements. Low-pressure laminate (LPL) is a single thin sheet of decorative paper that is saturated and compressed under low pressure and heat for a short period of time (approximately 600 psi at 392 degrees Fahrenheit for 20 seconds). The material is then fused directly to a wood substrate and is often used on the vertical surface of various kitchen, bath, and furniture applications. The term melamine is often used interchangeably with low-pressure decorative laminate and thermally fused panels within the laminate industry. What comes to mind when you think of low-pressure laminate (melamine board)? Is used for premium grade doors. Meets Window & Door Manufacturers Association (WDMA) I.S.1A-11 extra-heavy-duty performance standards. 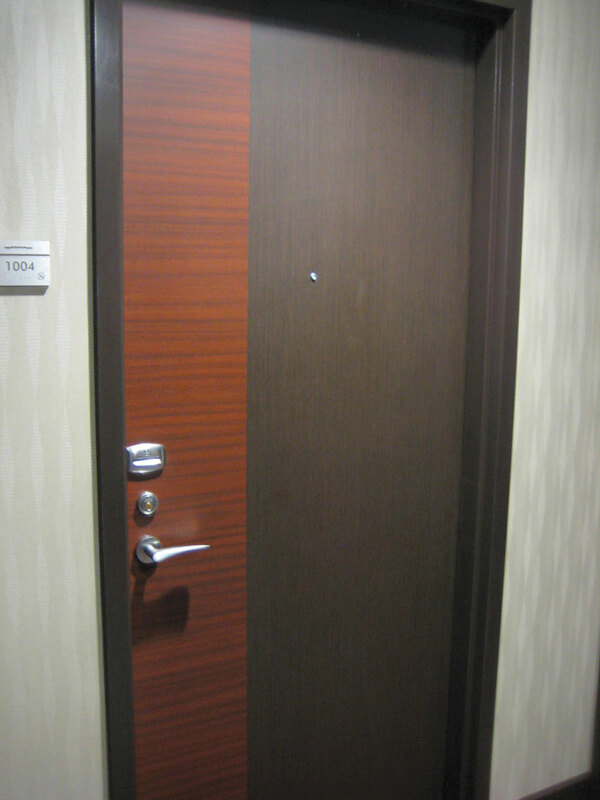 Is 0.048-inch-thick laminate used with three- and five-ply door construction. Is available from all leading laminate manufacturers in a variety of woodgrains, colors, patterns, and textures. Has edge-before-face construction, which prevents chipping and delamination. Minimizes "black line" along the meeting face and stile edge for a more aesthetically pleasing appearance. HPDL is available in a full range of colors, patterns, wood grains, and custom laminates, including silk screens and graphic images. A variety of colors and patterns are available from leading laminate manufacturers ranging from subtle to bold, and they are available in most standard finishes. HPDL woodgrain patterns are available from leading laminate manufacturers. Patterns range from popular cherry and maple to lacewood and bamboo cane. When used on architectural wood doors, the appearance is similar to wood veneer face material. Woodgrain patterns are often specified in door applications. Silk-screening works well where multiple colors or exact color reproduction are required. A design is screened directly onto a sheet of decorative paper and then made into a laminate surface. Silk-screening is ideal for incorporating logos and artwork that require bright, detailed graphics. Sketch face doors allow unique design customization. HPDL Sketchface layup adds visual appeal. Graphic image process works best in cases when “picture perfect” is the expectation. A full-color photographic image or original artwork is scanned into a computer and then transferred onto decorative paper. Custom graphic HPDL designs are only limited by the architect’s imagination.Virutally any image can be converted to HPDL. Less expensive than competitive PETG thermoplastic rigid sheet product. 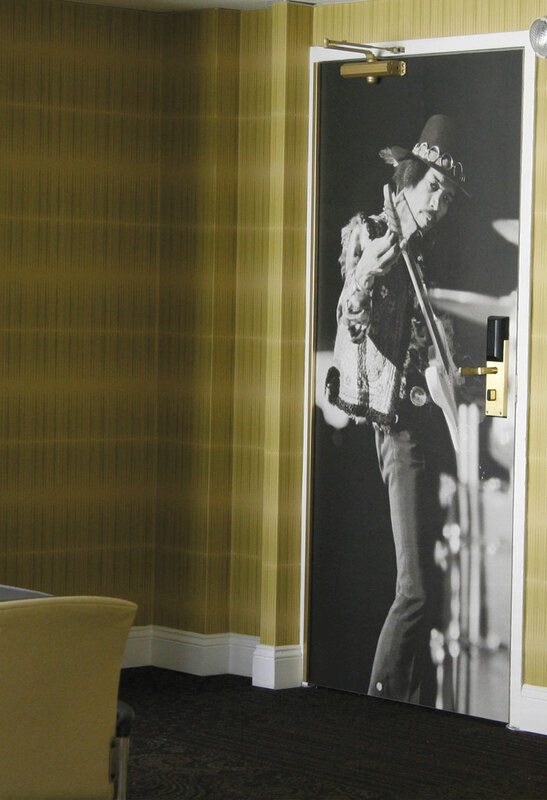 Stainless steel edge guards and PVC edges help protect the most vulnerable part of a door: the edge. Stainless steel edge guards are a hardware addition to the door that and are most often routered into the edge of the door to create a seamless transition between the edge guard and the face of the door. A PVC edge also serves to protect the edge of the door. Instead of a laminate edge, a coordinating PVC edge is applied to the door’s edge. The PVC edge offers the edge of the door an increased resistance to chipping and damage due to trauma on the door’s edge. They are recommended for high traffic areas, such as hospitals, manufacturing facilities, and emergency rooms. Additional features include mortised edge guards. They can be L-shaped or U-shaped. 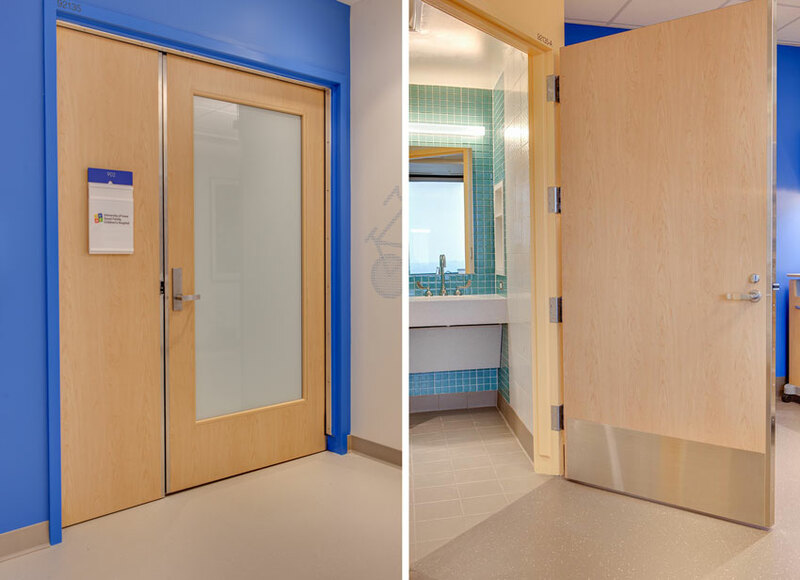 Stainless steel edge guards protect the door’s edge and are often used in high-traffic areas, such as hospitals.